The Channelsea River is a tidal river in London, one of the Bow Back Rivers that flow into the Bow Creek part of the River Lea, which in turn flows into the River Thames. 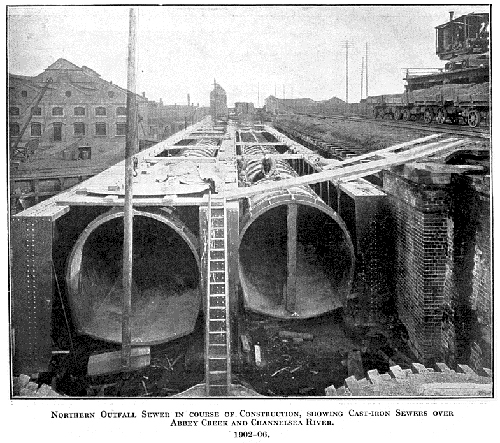 The Northern Outfall Sewer (NOS) is a major gravity sewer which runs from Wick Lane in Hackney to Beckton sewage treatment works in east London (east of Stratford); most of it was designed by Sir Joseph Bazalgette after an outbreak of cholera in 1853 and the “Great Stink” of 1858. The Sewer was part of Bazalgette’s enormous programme of works to give London mains drainage in the 1860s. The Abbey Mills Pumping Station, just to the west of this bridge, was the grandest single part of these works. The station itself was enlarged in 1891-96. Prior to this work, central London’s drains were built primarily to cope with rain water, and the growing use of flush toilets frequently meant that they became overloaded, flushing sewage and industrial effluent into the River Thames. Bazalgette’s London sewerage system project included the construction of intercepting sewers north and south of the Thames; the Southern Outfall Sewer network diverts flows away from the Thames south of the river. The original Channelsea Bridge was constructed in the 1860s to carry three 9ft diameter cast iron sewer barrels and it comprised deep wrought iron girders. The original bridge was provided with ornate cast iron parapets. The Northern Outfall Sewer bridge was built over the Channelsea River in 1900-02 to designs prepared in 1891-94 under Maurice Fitzmaurice, engineer. These followed a report by Sir Benjamin Baker and Sir Alexander Binnie, engineers, for the London County Council. The bridge was widened to carry five 9ft-diameter sewers, two more than its predecessor. The bridge widening comprised deep steel girders of similar appearance to the wrought iron girders of the earlier construction which were retained on the south side. At this time the cast iron parapet on the south side of the bridge was retained in place and the parapet on the north side was taken down and re-erected on the north side of the widened bridge. 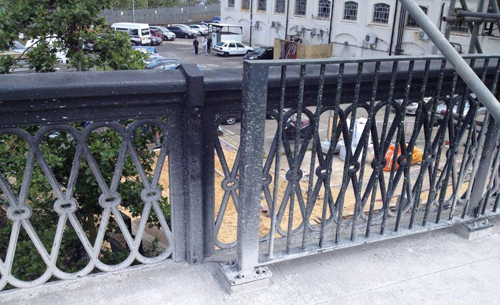 Therefore, the existing parapets to both sides of the bridge date from the 1860s. It is a significant part of the group of historic structures at Abbey Mills and reflects the early expansion of the complex to cope with London’s growing population. 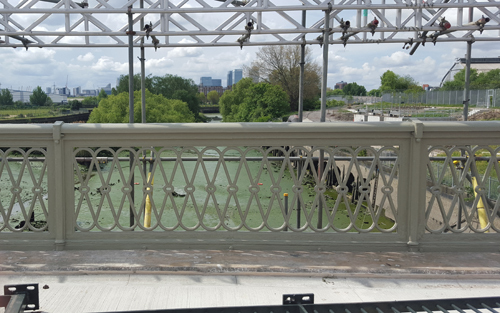 The bridge is constructed of steel girders with ornamental cast-iron railings over a guilloche frieze. The bridge is supported by outer brick abutments and two massive central supporting piers. It has polychrome white and black brick to the more public north side and yellow stock brick to the south, all in English bond. The copings are of millstone grit. The northwest abutment wall is curved, and the south abutment parapets extend about 18m to the west and 15m to the east to terminating piers. The bridge is Grade II listed. I was asked to establish the original colour of the ironwork. This has been taken from British Listed Buildings and Wikipedia.